Leta’s vision is to provide excellent legal services while making a positive difference in the lives of her clients. Leta’s work reflects true sincerity in the legal profession; furthermore, Leta has a genuine concern for the welfare of her clients. Leta has extensive experience in working with children and families in crisis. 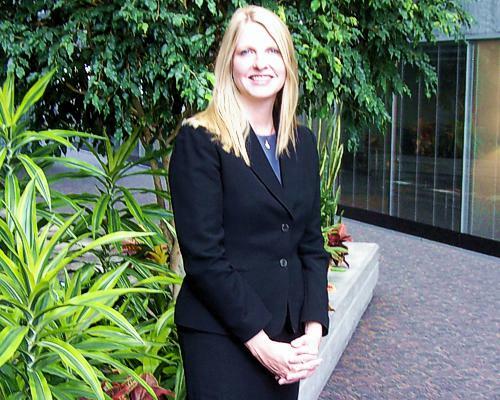 Leta provides quality legal services tailored to fit her clients' needs. Clients are her priority. Leta’s goal is to provide quality legal services in a timely manner. Leta listens to her clients, carefully explains available legal strategies, and works to successfully achieve her clients' goals and best interests. As Leta’s client, the legal advice you receive will help you understand your rights and options pursuant to Colorado law. You will also receive support from a competent, compassionate, and committed attorney who has your best interests at heart. Leta has been a Colorado licensed attorney since 2004 and served as a court appointed guardian ad litem for abused and neglected children for approximately eleven years. Leta has dedicated her legal career to providing quality legal services to her clients and helping the most vulnerable members of our society. Leta and her team were awarded with the 2010 Attorney, Guardian ad Litem of the year for the State of Colorado by the CASA organization. Leta was also awarded the 2005 Guardian ad Litem of the year award for 17th Judicial District by the CASA organization. Leta was awarded the 2015 Client's Choice award by AVVO for family law and juvenile law. Leta was on the best practice committee for the 17th Judicial District from 2008 to 2014. Furthermore, she was on the domestic violence benchbook committee in 2010, where she wrote a substantial portion of the dependency and neglect juvenile section of the domestic violence benchbook, which was published years ago by the Colorado State Bar Association. 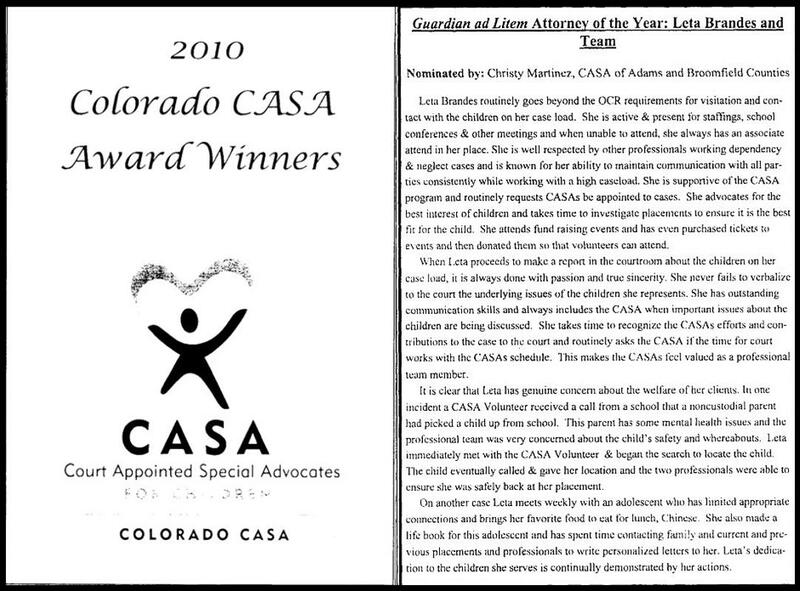 Leta Brandes and Team 2010 Guardian ad litem Attorney award for the State of Colorado given by the CASA organization. (Click on CASA logo to read more).